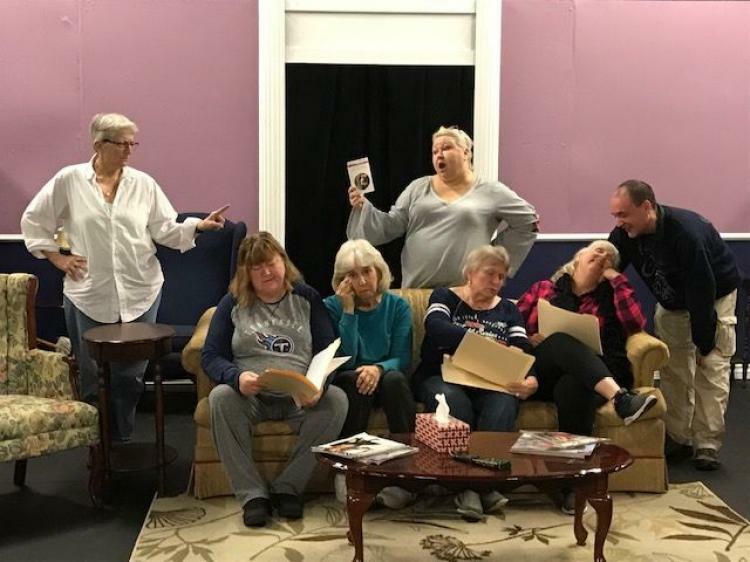 Encore Theatre Company, Wilson County’s premiere community theatre, announces the opening of their first production of 2019, Four Old Broads by Leslie Kimball. Directed by Sara Dhom, the show opens Friday, January 11, and runs weekends through the 20th – Friday & Saturday shows are @ 7:30 PM and Sunday matinees are 2:30 PM. House opens 30 minutes before showtime. Retired burlesque queen Beatrice Shelton desperately needs a vacation – and NOT another trip up to Helen, Georgia to see that “precious little German village for the umpteenth time.” A Sassy Seniors Cruise through the Caribbean may be just the ticket if she can just convince her best friend, Eaddy Mae Clayton, to stop praying and go with her. Unfortunately, things have not been very pleasant at Magnolia Place Assisted Living since Nurse Pat Jones began working there. The newest resident, Imogene Fletcher, is suddenly losing her memory. Maude Jenkins is obsessed with her favorite soap opera and planning her own funeral. Sam Smith, retired Elvis impersonator, keeps trying to bed every woman in the building. A mystery unfolds with laughter as the gals try to outsmart the evil Nurse Pat Jones and figure out why so many residents have been moved to “the dark side,” what exactly IS that mysterious pill, and what happened to Doctor Head? Hilarity ensues as Imogene goes undercover and Maude enters the Miss Magnolia Senior Citizen Pageant to throw Pat off their trail. If they can solve the mystery, they may make it to the cruise ship after all. For tickets visit TicketsNashville.com; tickets are $15 for adults and $12 for youth and seniors. You can also reserve seats and pay at the door by calling 615-598-8950. Encore Theatre Company is located at 6978 Lebanon Road in Mt. Juliet (just east of Highway 109.) For auditions and upcoming productions please visit Encore-Theatre-Company.org. Four Old Broads is presented by special arrangement with Samuel French Inc.